In the preliminary New York City Marathon results, runner # 64709 was listed with a finish time of 3:37:12, good enough for 2nd place in the W60-64 age group. The runner in question had run the Paris Marathon in a time of 6:25:15. The runner is pictured below proudly displaying their medal. This runner is not the person who registered for the race and was assigned bib # 64709. This is not a photo of an over 60 year old woman. Whenever I write an article about bib swapping, someone comments that it really doesn’t hurt anyone. But, the situation here is all too common. In many marathons that I check, there is some instance of a runner placing wearing someone else’s bib. Typically it is a younger runner taking an age group spot wearing the bib of someone much older, or a male wearing the bib of a female, or a combination of both of these situations. Our moment of glory is gone, The elation of placing is never as sweet as when one has just completed the marathon. The bib ‘borrowers deprive us of that. As I was writing this I confirmed that the runner was disqualified and the results were adjusted. I assume, based on the recently published policies of the NYRR that the runner will be banned from future events – although she lives in France and has a limited race resume – so that likely isn’t that big of a deal to the original owner. 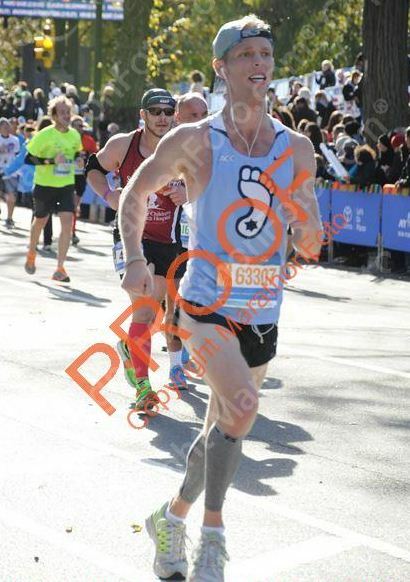 If anyone recognizes the runner that was wearing the bib, please notify the NYRR or myself directly. That runner also could face sanctions. Please consider a contribution to help support the site. Contributions help to offset costs associated with running the site and enable me to compensate those that assist in data collection, etc. Thank you Derek!!! As someone who prizes my age group wins, it is so exciting when you see it on the computer after your race and they announce your name. Just getting it online and the trophy in the mail loses meaning. Everyone knows when you sign up this is illegal. Follow the rules runners or hurt other runners. I don’t know if the color coding or numbers on the side of the bib mean anything for the NYC Marathon, but well designed bibs would certainly make it obvious when a 40 year old make is wearing the bib for a 60 year old female. I still believe the timing mats should be programmed to announce your name as you go by. Yes, some of the computer voice pronunciations would be comical, but it might help the aid station workers identify bib swaps, bib mules, and fake bibs before the race is over. Not trying to downplay this bib swapping, but, how many bib swappers have placed at races? It’s such a small number, especially compared to the large number of bib swapping that happens during races. For a huge race like the NYC Marathon, offering deferrals would solve the problem, at the very least cut down on, bib swapping. While it is true all runners agree to following the rule set by the race, it is time that all races, especially the bigger races offer deferrals. It is not rare at all. It happened with multiple placements in Los Angeles, I reported on it in Boston, Disney, etc. I’ll type slower so even you can understand. In terms of the overall number of bib swapping that occurs during a race, it is rare that one of the runners using a swapped bib will place. Pretty sure the number of bibs swapped during NYC Marathon was at least 100. To the person bumped out of a rightful place in the standings, what matters is that swapper, not the relative number of placing swappers to total swappers. And I appreciate that Derek is here making some effort to reduce *both* numbers. 3 years ago in NYC, this runner (a runner that started in wave 4) placed 30th “female” overall. So yes, it does happen. Serious problem in Ireland through marquee races and major marathons including Dublin City Marathon with 20,000 runners. ‘My’solution, photo ID on bib numbers, if the face don’t match the bib photo disqualification. Keep up the good work. It does matter. It would matter to me in a 5K. They used to have photos link right next to the result, so, for instance, you could easily click and see: ‘oh look, that supposed 60something top female in the results is actually a young dude in the pic’. Happened at the Bk ½ a few years ago when someone listed as the 50s woman AG winner, click on the link and see a smiling guy in his 20s. Photos are no longer easily available and I think you have to have an emailed link to find them? Have these changes been done on purpose to make it hard to find bib swappers? A runner, who’s not very fast, recently appeared in top 40s women results for a NYRR race. Someone pointed out that she was actually out of state that day, running another race. The name later disappeared from the race results, so it must have gotten reported/ discovered somehow. According to NYRR policy someone who swaps bibs is bounced from future NYRR races, yet this person just ran the NYC Marathon so… maybe NYRR missed it? Maybe the marathon is a separate database than their other/ regular weekly races? I’ll be interested to see if NYRR follows their own policies and if this runner runs in future races. I looked at the results of a NYRR I ran a couple of years ago and a solid 5 of the top 50 women listed in the results- 10%- did not actually run the race. A mix of dude(s) who ran, someone who ran with 2 bibs, no photo yet a 10K time faster than the time the listed runner ran the 5th Ave Mile… NYRR’s 9+1 program and 4 of 6 borough races program gives runners a tangible incentive to have someone else run under their bib if they themselves can’t make the race. Get in your 9 races or 4 borough races so you can run the NYC Marathon or NYC Half. sadly I think you’re right…just look at the results from the 18-mile tuneup and there are SO MANY in top AG positions who either only completed 2 loops (it’s a 3-loop race) or did a bib swap. NYRR actually reached out to me when I called that out on Twitter and said they “take cheating very seriously.” Really? Even after I had to point out results inconsistencies they still won’t fix them? One thing with these new results though-it shows gun time again. So those in high AG positions with a big gun/net time differential (due to being in a later corral) stick out like a sore thumb…. Printing the age group on the bib would certainly help deter this and also make it easier for the coral marshals to spot swapped bibs. I am in the M60-64 age group and it gets just as competitive as the open category. Indeed, the first thing I check in the results listing is where was I in my age group. Only after that do I look to see what my time was. Im glad this guy still got beat by a 60-64 y.o. woman. An orange, wave 4, corral D, placement predicts a 5 hour finish. A cursory look at the bib and a 3:37 finish should have risen some eyebrows. Just curious if the chip that is used for auto-timing @NYCM is embedded in the bib or is it attached to a shoe?